Diversity: In a career spanning 41 years John Dickson Carr published seventy-six novels and collections of short stories, wrote a raft of mysteries for radio (many of which can be found here), penned the official biography of Arthur Conan Doyle and a non-fiction account of the mysterious murder of magistrate Edmund Godfrey, wrote a column for Ellery Queen’s Mystery Magazine, and was made a member of the Detection Club as well as a Grand-Master of the Mystery Writers Of America. He created two long-running and dearly-loved sleuths, and in his later career branched out into exquisitely-researched and detailed historical mysteries that weren’t afraid to veer into the nonsensical – the time travel element of Fire, Burn! (1957) – or the fantastical – invoking a deal with the Lucifer himself in The Devil in Velvet (1951) – if they served his purposes. 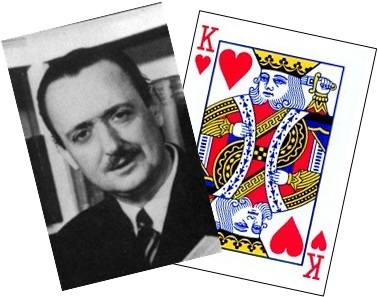 Let’s be very clear about one thing: I consider Carr the Regent Emeritus of crime, the single finest, most fulgently creative proponent of detective fiction ever to take up the craft, and in my eyes unassailable for the remainder of human history (just putting that out there so we all know where we stand…!). Not merely content with devising puzzles of a devious and beautiful complexity, he excelled at working in multiple themes and threads to his writing: The Case of the Constant Suicides (1941) is not only a chilling exploration of a possibly-supernatural cause of murder in an isolated Scottish castle, it’s also a bloody hilarious (Kate at CrossExaminingCrime recently and appositely likened it to a Wildean comedy of manners, and there are elements of screwball farce about it too) and startlingly fairly-clued whodunnit into the bargain. Now, were that the only book you could say this about then it wouldn’t be worth mentioning, but the simple fact is that once Carr hit his stride in about 1934 he produced novel after novel of such seamless changes of tone, and shot them through with so much well-judged humour, that in doing so he places himself head and shoulders above both his contemporaries and all-comers since. Growth: You do not talk about locked room and impossible crime mysteries today without someone bringing the conversation around to Carr, usually somewhere between their first and second breaths. Of course he didn’t invent the form, but he took it on and expanded its scope to the extent where very little written in the subgenre now isn’t simply a reheating of an idea Carr did first. Not content with merely killing someone inside a room with no-one else present, he’d treble-block himself just to prove how impossible it was: witness The Plague Court Murders (1934), wherein a man is stabbed repeatedly in the back while locked in a thrice-bolted and locked hut surrounded by mud which shows not a single footprint and a witness on the scene heard the victim pleading with their attacker before being killed. The ratcheting up of this complexity – and, crucially, its uncluttered and reasonable resolution – is a huge part of what Carr bought to the expansion of the crime novel. Nothing was impossible, not any more. But let’s also not neglect his radio plays. The most famous of these, Cabin B-13, shows how this complexity can be applied in a different form and how a simple answer can be brilliantly spun into a complex and confusing web if done subtly. And these were no mere radioisations of existing stories – indeed, in some cases the transfer occurred the other way around, with radio dramas providing the basis for novels – showing the seriousness with which he took these endeavours. behind the ghost on the links. the attack of migraine and the sigh. Apply this to Christie or Michael Innes and it’s a simple statement of how things work in their books; apply it to Carr and it takes on a greater resonance: there is always more than meets the eye and this will always be the case, such is the beauty of his construction. Carr’s output famously suffered as his health declined in his later years – he suffered a stroke in 1963 that left him paralysed down one side of his body – with several of his later books rarely warranting much of a mention when discussing his career. Honestly, in the same way that a single great book doesn’t make a King of Crime I don’t see why a few below-par ones should exclude him from consideration. Some may cite this as a worthy case against him, but the weight of evidence they’re ignoring is too great and too compelling to make this objection worth noting. He produced decidedly more than his fair share of great books and unquestionably exploded the scope, form and function of a genre that would be significantly weakened had he never picked up a pen. An additional point against him is this, then: if he’s so good, why is he so out of print? Aside from a couple of ebook publishers, five titles in paperback from Rue Morgue Press and the above-mentioned The Devil in Velvet put out by The Mysterious Press last year, a lot of Carr’s catalogue is idiotically hard to find. But, again, this is easily refuted. Availability doesn’t equate to quality (cf. Tom Clancy). It’s a source of mystery and consternation to me that at least half of Carr’s work isn’t readily available, and I sincerely hope that something is done about this given the rise of e-publishing, but it in no way lessens his claim to a crown. In fact, here’s an idea: 30th November 2016 will mark Carr’s 110th birthday. If any publisher out there wishes to acquire the rights to his books and use this date as an opportunity to relaunch the man and his works onto the world, I will assemble you a small army of bloggers who will – simply for the joy of having him back in print – proof-read and promote these books for you. So come on, who’s willing to publish the finest detective novelist of all time? Anyone? The King of Hearts because…: I should say something mildly corny here about my heart always belonging to Carr, but while that may be true I’ve made him the King of Hearts for a different reason. See, in the history of playing cards the King of Hearts is typically called ‘the suicide king’ due to the poor quality of early printing processes now leading to him being portrayed sticking a sword into his head. And if one thing is certain about a Carr novel it’s this: the more it looks like a character has committed suicide, the one thing they definitely haven’t done is commit suicide. ← #44: Who are the Kings of Crime? Nor but a rope to hang himself. However, I’ve to note here that I probably would have cast Carr as the head of the Golden Age pantheon (i.e. a diety), but that’s just me. I’ve only read one of Carr’s Bercolin mysteries, The Waxworks Murder. It’s absolutely superb! And very gothic. Not just a mystery with a few gothic trappings, but genuinely gothic. Carr understood the gothic. It’s also tremendous fun. An easy first choice. The second choice is likely to be Ellery Queen. The remaining 2 choices will be controversial ! Apart from Rue Morgue, I believe Langtail has released a handful of titles in paperback? I’ve been scouring the Kindle section of my local Amazon, and was disappointed that ‘Nine – and Death Makes Ten’, ‘The Reader is Warned’, ‘Peacock Feathers’ and ‘Nine Wrong Answers’ are not available. The majority of the available titles are those that belong to the *ahem* later part of Carr’s career. A minor point, but one that might cheer you: my Peacock Feather Murders is from Rue Morgue…quick! Check if it’s available! Yes, it’s a shame that a lot of the available titles are the weaker ones. I was lucky to have visited New York many years ago when there was still a plethora of second hand book shops and came home with at least 30 second hand paperbacks, including all of his greatest works. Undoubtedly the king of the locked room and much loved by many. You are a fortunate man, then. I have friends in three continents keeping an eye out for me…but one of these days we’ll get him republished in full, mark my words!